The Hunt family has been farming on the west side of Keuka Lake for seven generations. Farming has always been hard, but climate change is making it even harder these days. We depend on clean air and water, healthy soil, and a stable climate to make great wines. And that's why we're doing everything we can to help our region replace it's old dependence on fossil fuels with clean, advanced renewable energy. Right here on the farm, we've installed a 348-panel solar system that provides most of our electricity. We have an award-winning borehole (closed loop) geothermal heating/cooling system that has eliminated our need for oil and propane to heat our buildings. And since it's generally more cost effective to save energy than to generate it, we're always looking to improve how efficiently we use energy with things like LED lights and the insulation in our buildings. 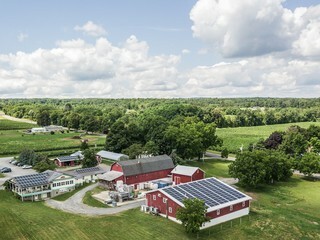 In 2015, Hunt Country and three other Finger Lakes wineries collectively received the Solar Champion Award from the Solar Energy Industries Association for our leadership in the transition to solar energy use. The other wineries that shared this award are Dr. Frank Vinifera Wine Cellars, O-Neh-Dah and Eagle Crest Vineyards, and Wagner Vineyards. In 2018, we installed five electric vehicle chargers for our customers to use. The soil is everything when it comes to growing grapes. Which is why we care for it so very much. We amend our soil using compost and poultry manure only, no synthetic fertilizers. The compost comes from our own on-farm composting operation that is fed with grape pomace from our presses, leaves and yard waste from the Town of Jerusalem and residents around Keuka Lake, vegetable and other plant waste from the farm, and various livestock manures. 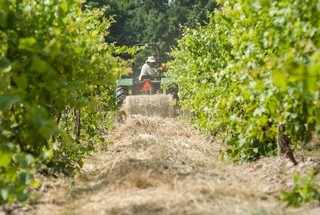 We roll out hay between the rows of vines to suppress weeds, hold moisture in the soil, and create improved habitat for the micro and macro fauna which are key to healthy soil. The 24 acres of land immediately surrounding our winery and tasting room are certified organic. At the south end of the farm, we have transitioned a block of Vignoles, Cayuga, and Niagara grapes to organic production. 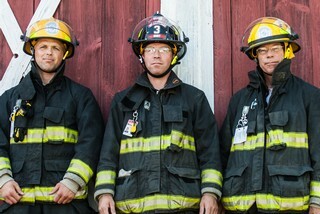 Art Hunt (founder and owner), Jonathan Hunt (director of winemaking), and Matt Kelly (director of media and communications) are all active members of the Branchport-Keuka Park Volunteer Fire Department. In fact, Art has been a volunteer firefighter for over 40 years. These guys get called frequently. In the middle of the night or in the middle of harvest, they drop everything and run. 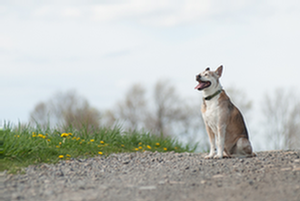 Every year we host our Dog Walk fundraiser for the Humane Society of Yates County. This includes special dog walk routes around the farm, demonstrations by the Yates Country Sheriff K9 team, and a gathering of dog-related vendors. We also donate 10% of our total wine sales for the day to the Humane Society. And we lend our support to the Humane Society of Yates County all-year round by sending them a portion of the sales from our Sweet Gus semi-sweet blush. All of the dogs at the farm are adopted or rescue animals.